He could make Ajit Agarkar feel like a hulk. Wafer-thin, unassuming and unshaven, Russel Arnold resembles the Biblical underdog David amongst the cricket's Goliaths. But as a team man, there is nothing he has not done. From opening the innings to batting lower down and bowling his off-breaks, he is a utility player, worth his place in the Sri Lankan side. The only Tamilian from the strife-torn region of Jaffna in Sri Lanka, he is proud of his pedigree. "I am the only true tiger in the team," he jokes. "Everyone thinks Muthiah Muralitharan is the only Tamilian in the team, but he is a South Indian from Madras, who relocated to Kandy." According to Arnold, before his country's independence the British got people from Madras to work in the tea plantations in Sri Lanka. Settled in Colombo, his parents are originally from Jaffna, the stronghold of separatist outfit Liberation Tigers of Tamil Eelam. His father's brother is a priest in a church there, though he has not visited the place since 1983. The left-hander, who had established himself in Sri Lanka's middle-order till recently, believes that cricket is a binding factor in the island nation. "Cricket has been the balm for this country. I've heard that when Sri Lanka plays there is cease-fire on the border. Everyone looks in one direction." The World Cup win in 1996 gave the Lankans a new view to the heights they could reach. "After that World Cup win we were known for something other than the war," he says. Discarded from the Sri Lankan team now, Arnold is on an Indian holiday with his wife, Sonali, a Sinhalese. Currently in Mumbai before he travels to Goa and then Bangalore, the 29-year-old batsman is quite frank about his decision to take a holiday. "I have a few weeks off. Just sulking about being dropped will get me nowhere. Maybe, doing something different could help me recharge my batteries," he says. Dropped from the squad that toured the West Indies this year, Arnold is realistic about his exclusion from the team. "I haven't achieved the standards that I'd have liked. It is good I have been dropped. I can now assess where I stand and what to do." Like in most cricket-playing countries, he learnt about his axing only from the local newspaper. "Actually before the Sharjah tour, Aravinda [De Silva] informed me that I might not go." But that's all behind him now. He is eyeing the upcoming 'A' team's home series, also involving India and Pakistan, and believes a good performance in it will make it difficult for the selectors to write him off. "Things haven't gone to plan for quite a while now, but I'm sure that they have to. It can't get any worse." Self-confidence, he believes, has got him thus far. "I was never technically sound. But I have a lot of self-confidence to pull myself through and get the runs. Whether the runs come through edges or from the meat of the bat, they are runs, and that's what matters in the end. Simple as that." Russel says he learnt the mantra of confidence from Arjuna Ranatunga, his first captain. "You need guts to be Arjuna Ranatunga. He had plenty of them. He always told me to be strong and to rely on myself." If he learnt about self-reliance from Ranatunga, his next captain, Jayasuriya, set the bar higher for him. "Jayasuriya is King Midas. Anything he touches turns to gold. That is how we view him. He is one of a kind. 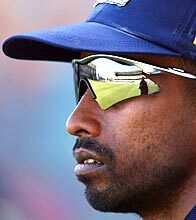 Tactically, as a cricketer, none of us could touch him. It is a good thing, but he expected us to perform at his level. That was not a very healthy thing to do in the dressing room." But Jayasuriya is not his all-time great batsman. That slot belongs to Brain Lara, he says. "Lara is a daredevil batsman. I rate him higher than Sachin Tendulkar, because when he gets going he tries impossible things; things you can't dream off. He will drive Muralitharan to square-leg or mid-wicket. "Tendulkar would play the ball through the line." His all-time favourite cricketer is Wasim Akram. "Akram on the field is a threat. We fear him when he bowls or bats. No other cricketer worries us as much. Someone like Klusener worries us as a batsman, but not so much as a bowler; ditto with Jacques Kallis."